Can a traveling bear raise awareness of domestic violence? This advocate says yes. People who know me quickly realize that I am passionate about my family, advocacy for victims of sexual or domestic violence and traveling. Finally, it looks like there is a way to combine all of these. Stuffed teddy bears have comforted children for years. Where Bear Traveled raises awareness of domestic violence in a fun and unique way. 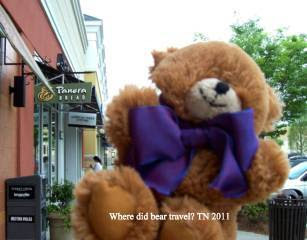 When I visit places to write a review about food or travel a stuffed bear is going to go with me. His photo will appear in many of my travel and restaurant reviews. People can follow our journeys at my You've Been Reviewed blog. Purple is the awareness color of domestic violence. That's why a purple bow features prominently in the photos. Later, I plan to add a sign that reads 'stop domestic abuse' or something along that line. Where Bear Traveled reinforces the statistic that tells us 1:3 women will be a victim of abuse in her lifetime and that 1:6 men will be abused. It also reminds people that 'it happens here'. Traveling takes its toll on people and on little stuffed bears. A forever home will be waiting at the end of each journey. We'll keep the sign but the bear (and any souvenirs) will be placed in a reusable tote bag and donated to a shelter. Staff members at the shelter may give it to any child or youth that needs a little bit of comfort. 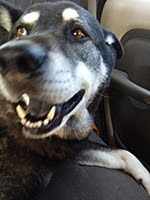 As a survivor, it is my hope that other survivors will hear about Where Bear Traveled and be encouraged. This message is simple. No one deserves to be controlled or battered. There is life beyond abuse. Be sure to follow our journeys at You've Been Reviewed. Very innovative! I'll be watching for Bear in your upcoming articles, along with the other good reporting that you do on this and other topics.